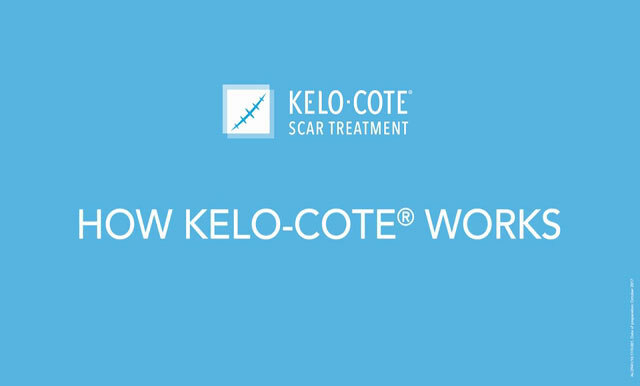 KELO-COTE® Scar Treatment - How Does KELO-COTE® Work? Any break in the skin sends signals to your body to repair the injury. To heal the wound, the blood clots and specialised cells called fibroblasts are sent to the site to produce collagen and bind the skin back together. Sometimes the healing skin forms excessive, unorganised collagen bundles that push upwards and form a reddened raised hard scar. Treating the scar with KELO‐COTE® helps to create an optimal environment by regulating moisture levels and collagen production in the skin. KELO‐COTE®’s advanced Silliclear complex is a blend of silicones that cross‐link and bond to your skin, drying within minutes, providing 24 hours of protection and treatment. This flexible, breathable layer helps the scar achieve a flatter, softer and less noticeable appearance. 1Puri, N, & Talwar, A. (2009) The Efficacy of Silicone Gel for the Treatment of Hypertrophic Scars and Keloids. Journal of Cutaneous and Aesthetic Surgery. 2 (2); 104-106.